Believe it or not, I actually haven't bought any fabric lately. I know, I must be ill. But it's ok, really. 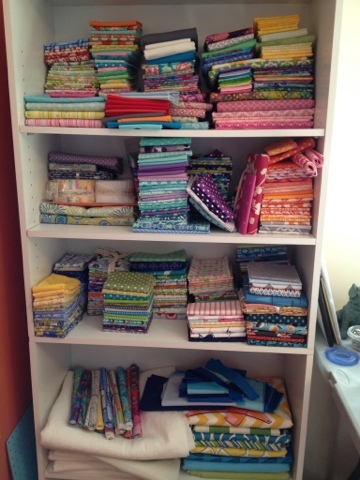 Since I've started really using my new sewing room, and pulling out fabrics that have been hidden away for a long time, my stash seems to be growing at an excelerated rate. 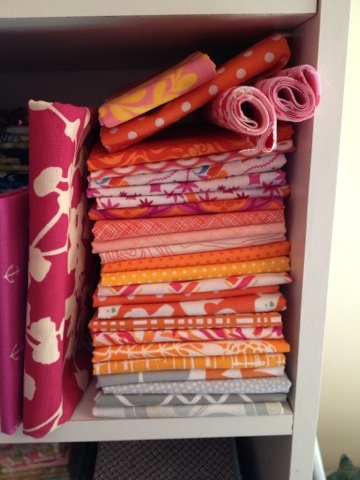 One of my goals for this year is to become more comfortable with cutting into well loved hoarded fabrics. I mean, I have a full fat quarter set of Good Fortune that I'm waiting for the 'perfect' project for. I've put together a couple of color stories that I'm thinking about using for the BOMs for this year, or Swoon. They are still getting rearranged, and I think they both need a little more depth, but we'll see what happens. I'll probably throw some solids in there too, since solids are my jam. I've started using my stash too! Those perfect, special fabrics? Yup, I'm just using them. I've had some yardage of old Kaye England fabric from 15 years ago....it's been waiting for the perfect project...and you know what? I've decided that thus stuff has to be used! Maybe using it will make the project "perfect". on PLAIN fabric)...And the quilt was hideous, really. I saw right away the need for some plains, if for nothing else, to make the pretties even prettier. I've never used white though. Still very opposed to white. Good luck! Your colors are great. I started using my beloved Sandy Gervais Stash this past Fall for a special project (I hoard every scrap I get, even Moda scrap bags, lol). To be honest I felt a little freer after doing that. It's hard though especially with the costs of fabric going up and up. Bonnie Hunter always seems to make the point (quiltville) that we need to use our scraps too after all they cost just as much per yard as it did when we bought the whole cut. I wish you well on your journey! That's a good way to think of it! 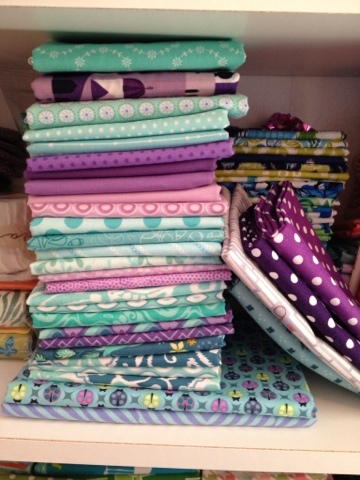 Your fabric stash looks awesome. You have them really organized.